Step 1: Create a two-slice pie chart. This example uses actual sales and sales left to hit the goal. 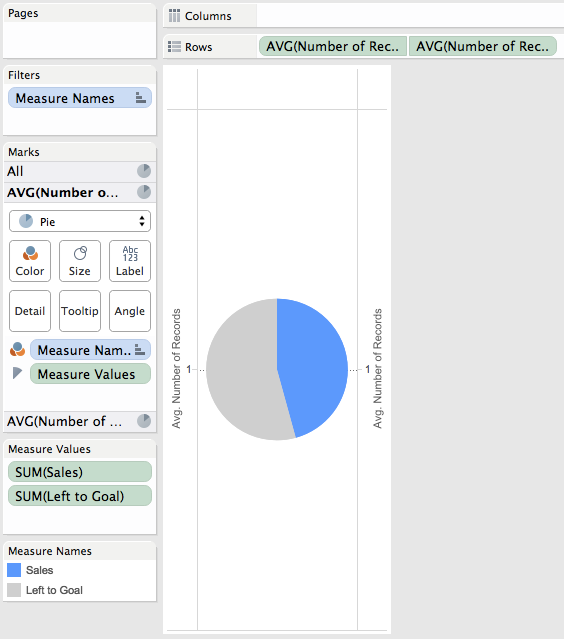 Step 2: Drag the Number of Records measure to the Rows shelf and change the aggregation to an average. Repeat this a second time and then right-click on the second pill and choose "Dual Axis". Finally, remember to synchronize the axes. Step 3: Double click on the left axis to bring up the Edit Axis window. Uncheck Include Zero. Step 5: On the secondary axis, remove Measure Names from color and Measure Values from Angle. Click the Color shelf and choose white. Adjust the size of the pie down slightly to reveal the donut. Step 6: Add Region to the Columns shelf and then hide the headers. Step 7: On the first pie chart on the Marks card, add Region to the Label shelf, set the alignment to the top and make the font bigger. 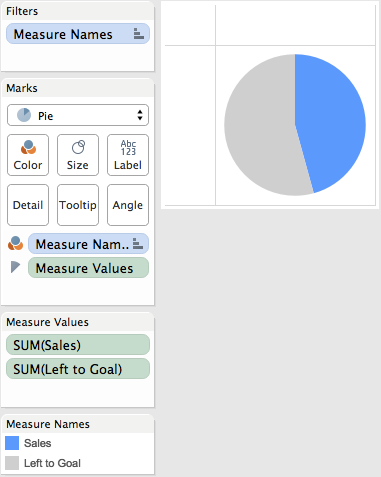 Step 8: On the second pie chart on the Marks card, add a % to goal measure to the Label shelf and customize the font. 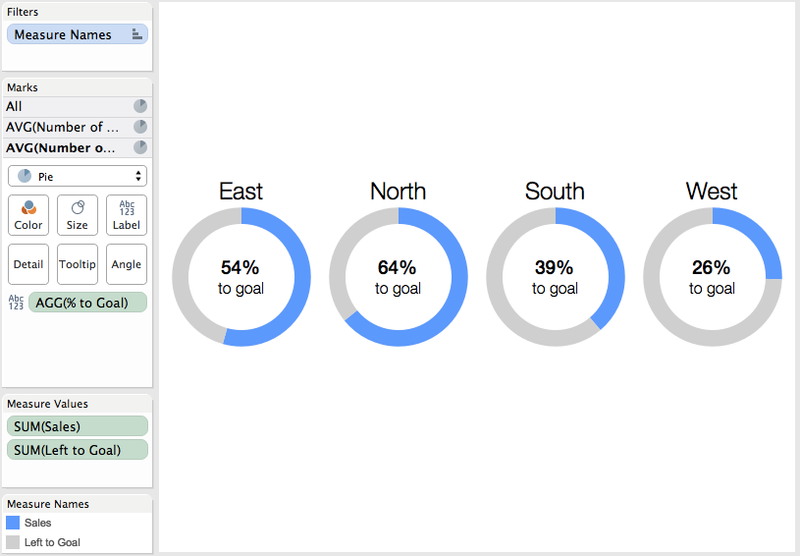 Step 9: Sort Region by the % to goal metric in descending order. Download the Tableau workbook used to create this post here. I know you are not a big fan of pie charts, but what if one of the regions above succeeded it's goal. Can we add a 3rd color to represent the success in the donut chart? Protyush, I can't recommend that you use donuts any time. I wrote this as a joke. 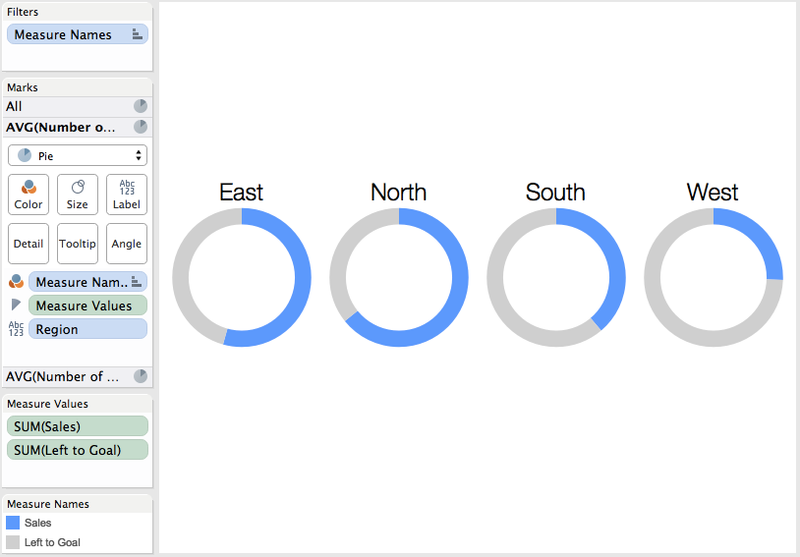 Thanks Andy for showing how to create a donut chart. Hi Andy: Any reason why you hate pie charts ? I learnt that atleast twice so far. First on your blogs, under About Me. And again here today. Hi Andy, Please send me the above created Donut Chart details. 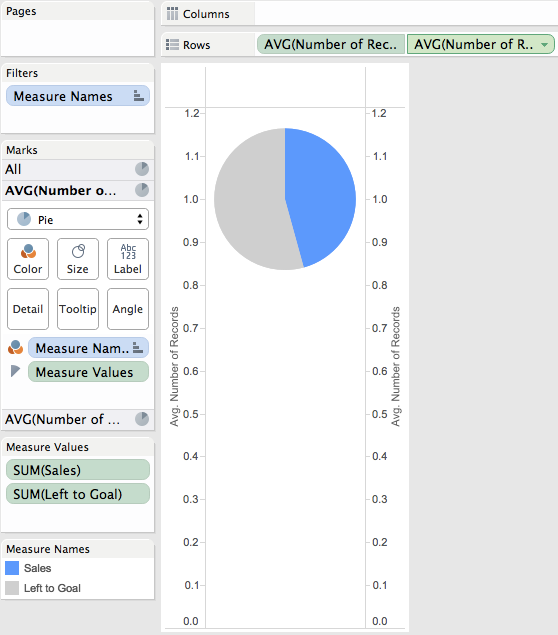 How to create calculated fields for Pie Chart for the above chart, i'm trying to that, but not clear for proper. You can download the workbook and see how it's built. How to handle the situation when sales has exceeded the goal? If sales goal was 100 and we sold 120. Simple, don't use a donut chart. Use a bullet graph instead. The thing that I didn't like about the visual result of the approach outlined above, is that once I surpassed 100% the pie chart would show a slice for the negative number that resulted from the calculated field. This made it so that the pie chart would just show a full closed circle with the percent complete (e.g. 115%) labeled in the center. It doesn't show graphically how much you exceeded your goal but it is well labeled and the donut shows a completed circle. This was good enough for my purposes, not sure if it accomplishes your objectives, Sharad. By doing this you're defeating the purpose of this chart type in the first place which is to measure parts to whole. You'd be way better off with a bullet graph. Hi Andi, Is there any way to set the anegel of the donut chat...............? Yes, you use the Angle shelf. 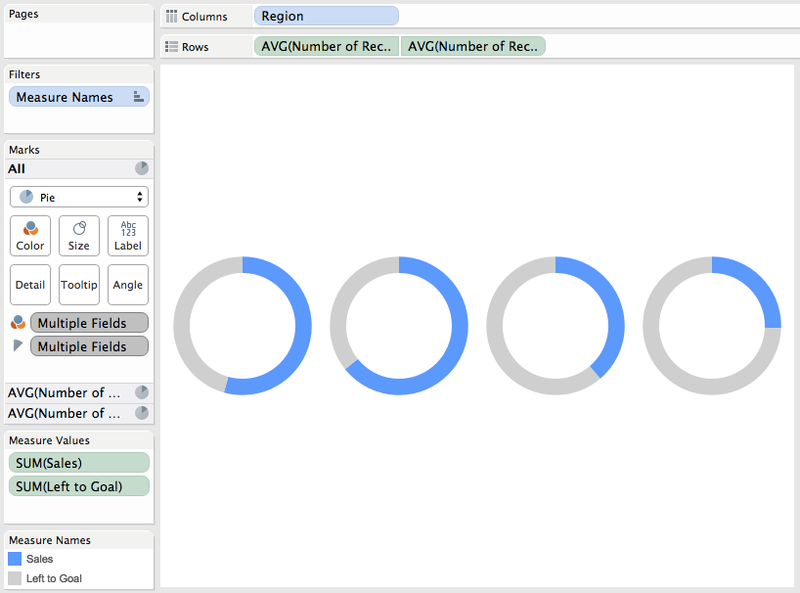 When I try to adjust the size of the second pie chart, Tableau also adjust the size for the first one. what should I do? You are likely adjusting the size on the All option on the Marks card. Make sure you only adjust the size for the metric you want to resize. Hi folks, I'm getting the same issue. Resizing one pie and the other one automatically adjusts to the new size. I'm selecting the Size individually for each metric as opposed to adjusting the size for 'All'. Anyone know how to decouple this? Ok, I figured it out. I had some extra marks on my second pie. Once I removed everything but the Label, I was able to resize the second pie without it adjusting the first. Can you add the pictures back ;) links are broken! This was our go-to place to pick up donut making instructions! Make sure you have everything on the text shelf on one line. I suspect you have several lines of text. I only have the text on one line, and the position will be changed anytime I click different values in parameter. Thanks for the great guide. I have an issue. I have created my donut chart, and filtered by relative date (current month). 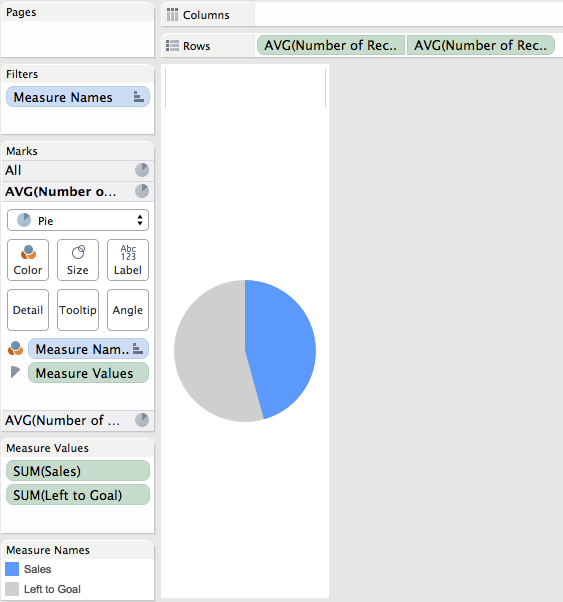 Hvem no data has been inserted by the 1. of the month, the donut disappears. How can I make a rule to show the pie and the % even though no data has been inserted? How can you expect Tableau to draw something if no data exists? The pis illustrates reports made on 82 locations. Then you need a separate chart in the view that only displays on the first of the month and hides when it's not the first of the month. Please don't be ridiculous and create a view with 82 donut charts. I just tried removing the Measure Names from color and Measure Values from Angle in the secondary axis. But it removes the entire chart, is there a way to lock the all options in the marks card. Tried it in my worksheet and also in your workbook in sheet -4 . Need some help here. Ok I figured it out. The size of the first axis needs to increased. Andy, can I rotate the pie chart to start on the horizontal axis instead of the vertical Axis? This is awesome! Although I don't yet understand why Number of Records is used. I don't have another suggestion, will just accept because it worked. Any thoughts on showing this in a Speedometer view. For example 1-3 represents a Low-Med-High risk ranking. color scale also. Needle points to the respective ranking. Get the idea? How will the donut chart look like if sales exceeds the target(goal)? How will the visualization look like? Simple, don't use a donut chart. Use a bullet graph or other alternatives. I can't find example on the list of files. I'd really like to see what your data looks like. I am getting pie angle and percent that just don't match. Download the workbook and unzip it. 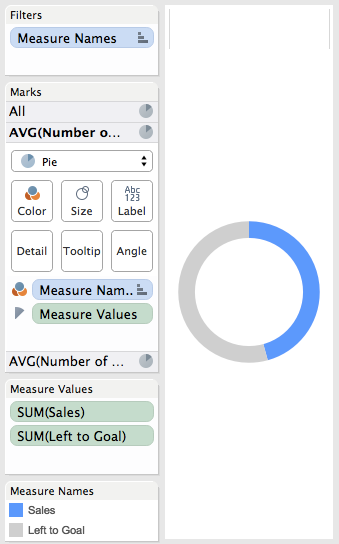 Is there any way to make the donut conditional formatting with fixed sized slices? I mean the size of the slices won't change , only the color ofeach portion change individully? Why would you want to do that? The slice is the data value. You'll only confuse your audience. Hi Andy! Is there any way to force single donut to fit whole container on the dashboard? Making it smaller/taller works only for certain resolution. Donut is clipped when showing graph on the smaller resolutions :/.. It works properly with single axis but with dual it seems to be broken..
Not that I know of. I build the donuts, stick them in the dashboard, then go back and play with the sizes.